At the end of the 1963 race season, and following the last 2 saloon car races when the Lotus Cortina had made it’s very successful debut, Colin Chapman had an idea. He wanted to give the Lotus Cortina the sort of suspension setup worthy of the Lotus name, adding more value for Lotus, and of course, keeping his race lads busy during an otherwise quiet time. CABC had always dismissed the cart-spring suspension and drum (rear) brake setup of the standard Cortinas as something archaic, and not a design to be associated with Lotus. His rather hurried adaptation of the Lotus Seven ‘A’ Frame rear suspension concept to the Cortina looked like a great idea on paper, but in practice was totally inappropriate, even for the race application for which it was adapted. After only a few miles of testing, the first ‘A’ Frame car developed ripples around the roof and rear wings as a result of the suspension forces being directed in one spot…the centre of the inner rear wheel tub. The old leaf springs had spread the load, effectively triangulating the forces between the spring hanger areas on the chassis rails. So the famous re-enforcement bars were added to the boot and interior of the Cortina, to put back the triangulation of the rear suspension removed by the ‘A’ Frame. Adding weight to a car to solve his design shortcomings must have been a painful exercise for Mr Chapman! Even by September 1963, it was also becoming apparent that there was a significant weakness of the back axle caused by the ‘A’ Frame design, causing real issues of reliability. So an independent suspension setup was designed by CABC, utilizing modified Elan components. It was more in keeping with Lotus design, and would overcome the shortcomings of the ‘A’ Frame setup. CABC claimed that this was the suspension configuration that he had wanted in the first place for the Lotus Cortina, and of course, it would increase the Lotus share of the value of the car. 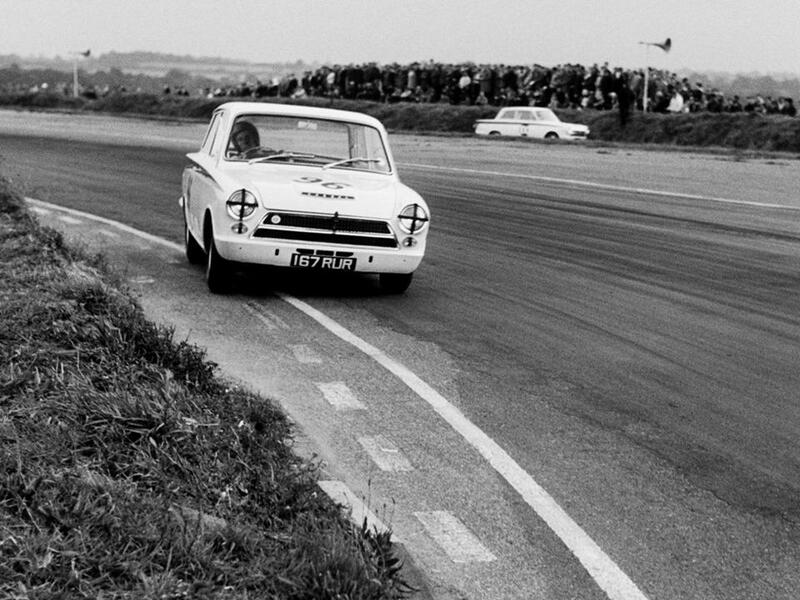 167 RUR was the first Lotus Cortina that Jim Clark raced at Snetterton in September 1963, and it finished with a very tired engine. Bob Dance recorded in his diary that the independent suspension modifications were completed on this car, and in fact, it was the only car which was converted. 167 RUR was re-registered as a new car in December 1963, with the registration number 550 VAR. 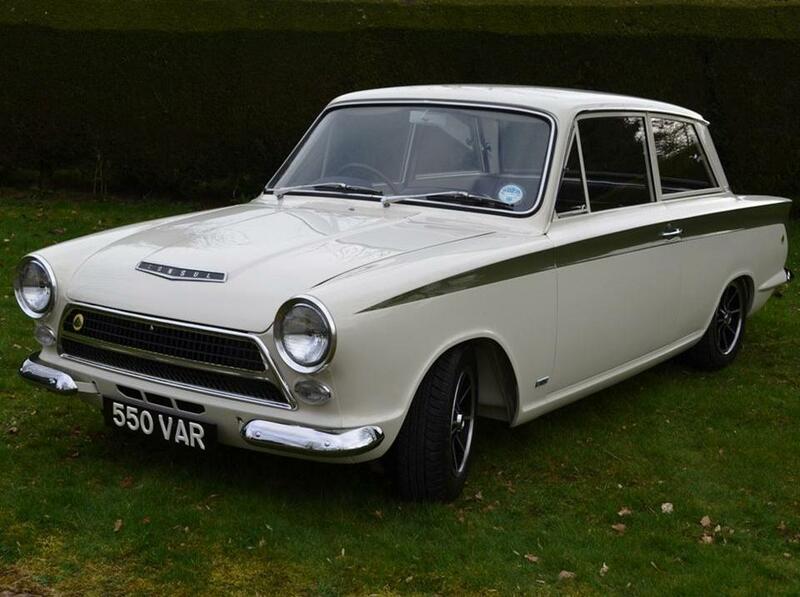 The package was to be known as the ‘Special Equipment’ (S/E) Lotus Cortina. 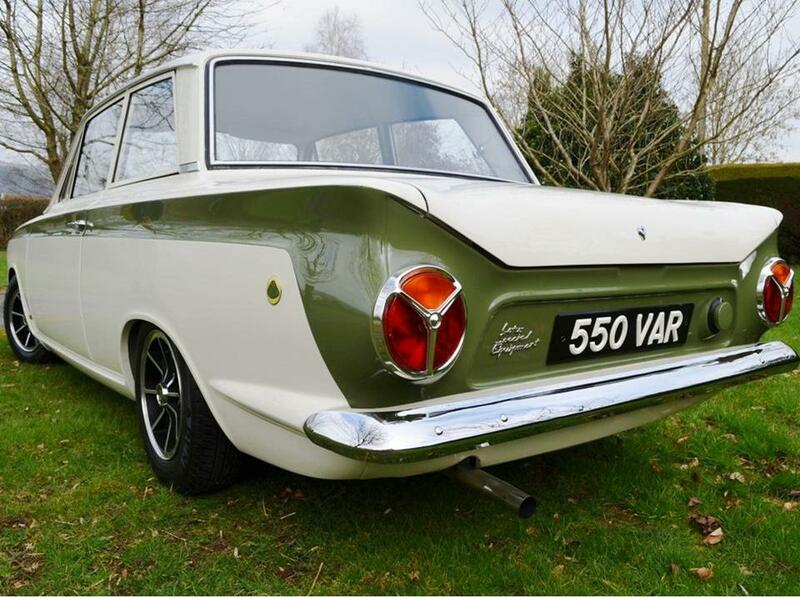 The car was tested by Colin Chapman, Bob Dance and Jim Clark, and seen as a great success and a big improvement over the ‘standard’ Lotus Cortina, but Ford felt that it was going to be too expensive, and was a step (or three) too far for ‘their’ Cortina. The S/E package carried on, but as performance improvements only, without the independent rear suspension and rear discs. 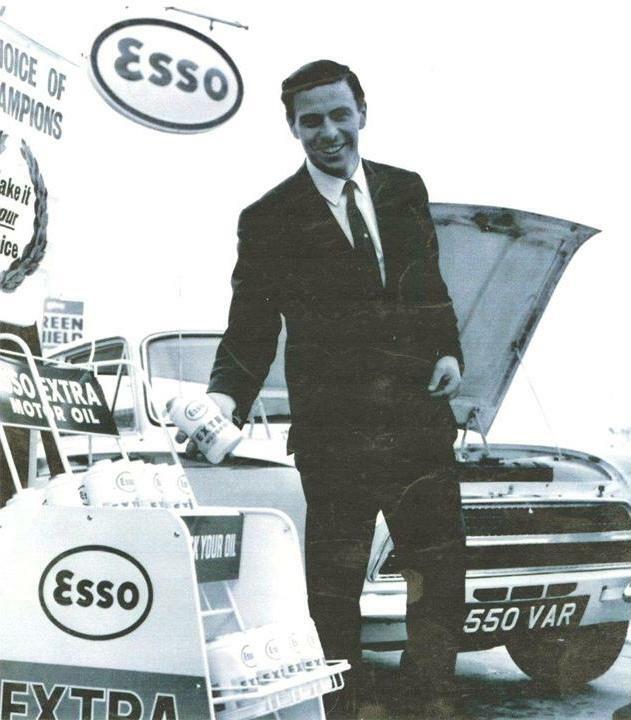 Jim Clark had 550 VAR as his ‘company car’ up until he died in 1968, putting some 20,000 miles on it, mainly around Berwickshire where the car became well known. I saw this car for the first time ‘in the flesh’ at the Brands Hatch Lotus Festival in August 2013, and it caused quite a stir when it turned up. Sir John Whitmore drove Jack Sears and the (then) owner and his wife around the circuit in 550 VAR, and the car was driven up onto an old Thames Trader car transporter for us all to have a look at the rear suspension. Will Payton had brought his immaculate Pre-Aeroflow car (178 TJH) along to be displayed (which won car of the show) and he also got very excited by this ‘Jim Clark’ car. So much so that 3 months later it had changed hands, and 178 TJH had a new stable mate. Will has spend several hundred hours on the car since then, stopping the oil leaks, overhauling the rear suspension and brakes, and detailing the bodywork, engine bay AND underside to perfection. The car looked good at Brands, and now it looks absolutely stunning. I have taken many detailed photos of the car, and also have some photos of the renovation completed by Trevor Barefoot whilst he had it in his collection. Some of these are shown on the following pages. But first, a background of the car, as written up in Classic Cars magazine in September 2010. Since the Sixties, Bob Dance has kept a log covering the records of everything he has done to every single works Lotus, right up to the 1963 Championship-winning Lotus 25 he is currently working on at Classic Team Lotus. He shows me the entry in capital letters: ‘TUESDAY 19TH NOV 1963. STARTED WORK ON IRS CORTINA FOR FORDS’. Dance began constructing a lightweight tubular structure to which a Lotus Elan differential, rear hubs and brake discs (regular Lotus Cortinas made do with drums) were attached to a pair of specially-made driveshafts with Elan rubber doughnuts at each end. The assembly was suspended in typical Lotus fashion with adjustable coil-over dampers. About three weeks later the car was finished and needed road testing; normally one of the chaps from the competition department would give the car a run to the end of the M1 – which in those days was at Weedon – and then back to Cheshunt to bed everything in. But on this occasion it was different. Chapman wanted Clark’s opinion on the layout so he asked him to give it a good run “...to see what you think“. Clark used it to go up to his family home in Scotland and he must have liked the car, because from then on he continued to use it regularly. Lotus Cortinas normally left the factory with 165mm wide tyres mounted on 5.5J x 13in steel wheels but Clark’s road car always ran on Dunlop alloys, almost certainly because of a contractual obligation. Dance recalls Ford looking at the IRS Cortina very closely, but eventually a decision was made not to put it into production, inevitably because of the extra production costs involved. Once that decision was made Ford decreed that this unique prototype should be destroyed because it didn’t want the car getting into the hands of the public. But when Jim Clark was killed in April 1968 his brother-in-law Alec Caulder arranged to buy it from Colin Chapman. Either to avoid too much attention from over-enthusiastic Jim Clark fans or because the car was supposed to have been destroyed, Caulder changed the registration from ‘550 VAR’ to ‘LNK 137C. He drove it himself locally and around the family farm in Berwickshire for years. The IRS Cortina was all but forgotten until 1987 when Caulder sold it to a Hertfordshire garage from where Andy Middlehurst, the four-times British Touring Car Champion and classic racer bought it. There was still loads of farm mud underneath, the rear wheelarches had been cut out inside and there were some horrendously tall tyres on it, which kept catching on the rear bodywork. Middlehurst realised the importance of the car and contacted Bob Dance who verified it as the ex-Jim Clark IRS Lotus Cortina before the restoration commenced. After dropping the whole rear end out, Middlehurst meticulously rebuilt the car as new. The original aluminium doors, bonnet and bootlid remain but the front wings had to be replaced. It was also re-registered ‘550 VAR’. In 1991 racing boss Tom Walkinshaw bought it and kept it until Wyles Hardy & Co’s TWR/Arrows liquidation sale in 2003. The Cortina then passed through the hands of a couple of other people before finally arriving at JD Classics in Essex who sold it to its latest guardian. As noted on the rear panel in chrome script, this Cortina was a very early Lotus Special Equipment model. Fortunately, it still has its original tweaked engine, number LP127, with SE camshafts, big-valve cylinder head, twin Weber 40 DCOE carburettors, large bore exhaust, and the original green cam cover. The cylinderr head was gas flowed and ported in period to help the engine develop 115bhp at 5750rpm and 1151b ft of torque at 4250rpm – up from 105bhp/1081b ft.
As with the original pre-1965 A-bracket located rear suspension cars, extra stiffening braces behind the rear seat run from the rear wheel arch to the chassis in the boot, requiring the spare wheel to be bolted flat to the floor. Peer underneath and examine the thin triangulated tube construction of the rear suspension and the Colin Chapman ideal of ‘just add lightness’ is very clear. We undertook an interesting diversion in producing two Lotus Cortinas with independent rear suspension: the first was very much an experiment while the second was built as a road car for Jim Clark.